The November 2012 issue of Dwell magazine (content not yet online) introduced me to Casa Kids, a Brooklyn-based children’s bedroom furniture company led by designer Roberto Gil. What amazes me about the furniture is how it is perfectly designed for small-space living. In addition to being very well made, almost all of the furniture also increases the function of a room — something that is so important in tight living quarters. You can check out the furniture online or in person at their showroom at 106 Ferris Street in the Red Hook neighborhood in Brooklyn, New York. Most of the large pieces of installed furniture hover in the $4,000 price range, but smaller items are significantly less expensive. 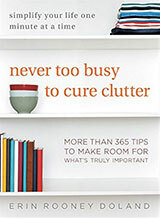 According to a recent study released by the UCLA Center on the Everyday Lives of Families, U.S. families have reached “material saturation.” The back areas of our homes (closets, basements, attics, cupboards) are so stuffed with possessions that our things spill out into our front areas (table tops, floors, furniture) and create more visible clutter than ever before in the history of the world. We’re no longer enjoying leisure activities and our children’s stuff is at the top of our clutter piles. 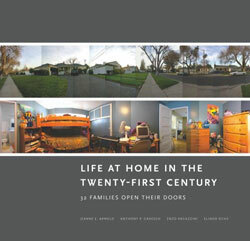 Published July 1, 2012, Life at Home in the Twenty-First Century examined the homes of 32 southern California families. The visits took place from 2001 to 2005 and involved families with two parents who worked full-time and who had 2 or 3 children in the home (and at least one of those children was between 7 and 12 years old). The families represented multiple ethnic groups, neighborhoods, occupations, and income levels. Data was collected on each family through week-long in-person site visits, interviews, videos, and surveys. The study makes one point very clear — clutter and children have a strong correlation. Our data suggests that each new child in a household leads to a 30 percent increase in a family’s inventory of possessions during the preschool years alone. How is it that children lead to such a drastic increase (30 percent!) in possessions? The researchers provide two explanations: parental guilt because of working outside the home and generous grandparents. The United States has 3.1 percent of the world’s children, yet U.S. families annually purchase more than 40 percent of the total toys consumed globally. Spilling out of children’s bedrooms and into living rooms, dining rooms, kitchens, and parents’ bedrooms, the playthings of America’s kids are ubiquitous in middle-class homes. … A sense among working parents that they have less time to spend with their children may be spurring them to shower kids with toys to compensate for a perceived loss of quality time at home. Other relatives contribute to children’s material assemblages, including about $500 spent by grandparents each year on toys, clothes, books, and other gifts. Given the high divorce rate in the U.S., many children wind up getting gifts from multiple sets of grandparents. Another interesting correlation emerged during the study of the 32 families was that the number of items on a family’s refrigerator seemed to have tracked to how much stuff cluttered up the home. The more densely populated the front and sides of the refrigerator, the more crammed the house was with stuff. … the refrigerator panel may function as a measuring stick for how intensively families are participating in consumer purchasing and how many household goods they retain over their lifetimes. U.S. families are no longer taking advantage of the bicycles in their garages, the hot tubs or swimming pools in their backyards, their swing sets, or their patio equipment. Items conducive to relaxation were purchased by the families in the study, but rarely or never used. Leisure is indoors. Most families have cluttered home offices or desk spaces with computers that are visually stress inducing and intrude on indoor leisure time, reminding families of workplace commitments. The material residue of families’ vanishing leisure includes these overused home offices and rarely used back yard patios and play areas. In a recent interview in The New York Times, Anthony P. Graesch, an assistant professor of anthropology at Connecticut College and one of the researchers of the study, commented that he believes U.S. families are overwhelmed by their stuff. Stress levels are almost as high as the clutter. In this interview, he provided more reasons for how he believes physical possessions have taken over U.S. families. We can see how families are trying to cut down on the sheer number of trips to the store by buying bulk goods. How they can come to purchase more, and then not remember, and end up double purchasing. In short, a family’s desire to save time ended up costing space and creating anxiety. Finally, he postulated families could reclaim their homes and stress levels if they became more comfortable with letting things go. Ask Unclutterer: How do you create resolutions when you’re coming up on a major life change? How do you define goals or resolutions when you know your life is about to change dramatically? I am due with our firstborn, a son, in early 2012 (our due date is February 4th) … I don’t know how to plan my life around such a big addition. I would like to lose the baby weight (plus some), but I have no idea what that will look like with a baby in the mix. My friends and family are not goal-setters like I am, so I don’t know who to ask for help setting goals around the unknown. Any advice? Congratulations on your upcoming new addition! Since you enjoy setting goals and resolutions, I suggest you go ahead and make the ones you wish to make. You won’t stop being you when you become a parent (or when you experience any major life change), so go for it. Do some soul searching, make your lists, and create a 2012 Resolution Action Plan. Resolution enforcement police won’t come and arrest you if you don’t cross all your resolutions off your list by December 31, 2012. Worst case scenario, you won’t achieve any of your resolutions by the end of the year, and you’ll save yourself some time coming up with resolutions for 2013. Plus, after your son is born and you become accustom to being a parent, you can always revise your resolutions. 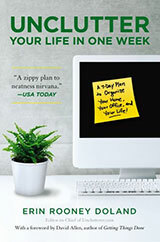 Think of it as a bonus opportunity — a goal-setter’s dream — to come up with a new plan in the middle of the year! Irrespective of parenting, anyone can revise resolutions and goals as necessary. Your 2012 Resolution Action Plan isn’t law, but rather a living document you can reassess as you wish. The first two months of parenting, at least in my experience, are very similar to the first two months of a new dating relationship. You’re head-over-heels for this new person in your life and you withdraw from your friends and responsibilities for awhile while you get to know the new person. After two months, you start to enter back into a normal routine, but with this new person in the mix. Since our son was healthy and a good sleeper, being a new parent was actually pretty easy until he learned to walk. I could strap him in a stroller and go for a run or put him in a carrier and go to the grocery store. When he started walking at 9-1/2 months is when life as a parent got more complicated for us. Luckily for you, most boys don’t walk until around their first birthday, so you could get 2-1/2 more months of the easy life than we did. All this being said, every child is different and your son’s temperament, health, sleeping and eating patterns, and preferences will dictate how much time you can spend doing things not immediately related to caring for your son. Go ahead and make the resolutions, but don’t feel bad if you don’t achieve all of your goals by the end of 2012. You’ll at least have been loving and doting on your child instead, which is still a wonderful accomplishment. Thank you, Amanda, for submitting your question for our Ask Unclutterer column. Once again, congratulations on your forthcoming adventure in parenting. My husband and I are hoping to adopt a newborn. We could therefore be in a position of bringing home a newborn with very short notice. On the other hand, we could be waiting years. Some people I’ve talked to in a support group have said that they set up full nurseries, but that doesn’t feel right to us. We want to be prepared, but we don’t want to keep a lot of baby stuff to make us sad that we’re still waiting. Do you have any advice for figuring out and balancing what baby stuff we should get in order to avoid panic if we get the call, but without having stuff around that would end up as physical and emotional clutter until the baby comes? Thanks. Initially, this question might seem like its answer will only apply to people in your very specific situation. This is not the case. When anticipating any life change, we all go through something similar. We want to look forward to the event (graduating college, starting a new job, having a biological child, getting married), but we also don’t want to be consumed by it. We don’t want the “one day” stuff to clutter up the present, but we also want to be properly prepared. When we were in your exact situation, we did not set up the nursery. Even after we were notified we had been chosen and we had his delivery date on the calendar, we did not set up the nursery. It wasn’t until after we brought our son home that his nursery was assembled. For one of our many state-mandated house visits for our home study, we had to show we had a place for our son to sleep and basic supplies for him. We showed our social worker what we had purchased, and all of it was being stored at the back of our bedroom closet. We had a Pack ‘N Play with a bassinet attachment (still in the box), a set of sheets for the Pack ‘N Play (we washed them and had them stored in a shoe box), a stroller (also in its box), a baby carrier a friend loaned us, a six pack of BPA-free bottles (still in plastic), and a diaper bag (but no diapers or wipes). That is all. State law required we buy the car seat within 24 hours of picking up our son, the box had to be unopened, and the receipt had to be taped to the box. So, obviously, we didn’t have a car seat, though we would have had one if the state would have allowed us to. Since we didn’t know at the time if our child would be a boy or a girl, how large the child would be, or if he/she had any dietary restrictions or allergies, we didn’t have clothes, diapers, or formula. When we picked up our son, he actually came with some clothes, diapers, wipes, and formula. He also had a blanket, a stuffed animal, a quilted book, and a photo album. As we were walking to the car, my husband remarked that he was unaware children came with so much stuff. Even people who have biological children will comment that they didn’t realize they would be leaving the hospital with so many things in addition to their kid, but everyone does. Manufacturers of all-things baby and different charities give tons of stuff to hospitals every year that are passed along to new parents. We have no regrets about not setting up a nursery. That being said, if there comes a point when you really want to make up the nursery, go for it. There isn’t a right or wrong way. You do what is best for you. It took us two and a half years from when we started the adoption process to when our son was home, and I can’t imagine walking past a decorated room that entire time. (People who have biological children don’t typically set up a nursery before they’re pregnant, so I don’t think our decision was all that odd.) For other adopting parents, though, a decorated room is a source of hope and excitement. It’s what works for them, and that is great for them. You do whatever you have to do to keep your sanity through the waiting period. I offer the same advice to anyone eagerly anticipating a life change — do what is best for YOU and helps YOU to keep your sanity while you wait. If the stuff associated with the big change is a distraction (as it was to us), keep it out of the way or don’t have it at all. There will always be a way to get it when you need it. Besides, if your adoption ends up being from out-of-state, you’ll have to spend at least two weeks in that state before being able to travel home. You can always order everything you’ll need while you’re hanging out in the hotel (best yet, get a room in an extended-stay hotel, you’ll want the dishwasher and refrigerator) and all of the nursery stuff will be delivered by the time you get home. If you feel like you should do something while you wait, I recommend reading books on parenting and child development. Ask your friends and family members with children what authors they like, and read those works. I’m a fan of the Love and Logic series, the Healthy Sleep Habits books, and Laura Berk’s child development texts. You won’t have much time to read once the little one arrives, so check out the books now. Plus, reading a bunch of different books on parenting styles will give you an idea of what type of parent you want to be. Another thing you can do while you wait is interview pediatricians in your area. We did this and it was nice to be able to sit and talk with the doctors about their styles of treatment without the pressure of “we need a doctor right now” hanging over us. The first time we took our son to the doctor, we already felt comfortable with his doctor and knew all about her experiences working with adopted children. Thank you, Sarah, for submitting your question for our Ask Unclutterer column. I hope I helped you in some way, and good luck to you and your husband on your adoption. My husband and I both have large families that we need to travel to see. We also have a large network of friends. We both value these relationships immensely and [try to] make them a priority in our lives. We are expecting in August, my husband is finishing up a degree now, and I am working full time and a doctoral student on the side. We also have 2 dogs that we love to pieces and we enjoy spending time at home with them. Many of our friends and family members are celebrating big events this year — weddings, graduations, etc. They would also like to see us as much as possible before and after the baby is born. My question is do you have any tips to balance the needs and desires of ours and our loved ones to visit and spend quality time together without overrunning our weekends and our budget? I feel pulled in too many directions. We have stuff to do at home, have a very tight budget (that I manage well, but still), and enjoy being home together, we would like to see our local friends and leave time for impromptu summer BBQs and hikes, but the people and the events that also require our attention feel too important to miss. I don’t know if this is an issue of priorities, budget, or too many close relationships (that has always been such a blessing in the past! ), but it is stressing me out having to choose between my loved ones and feeling like there is not enough time left for myself. Any ideas? In your last six weeks of pregnancy, you’re simply not going to be able to travel long distances to see friends and family members. Even if your doctor gives you permission to travel that close to your due date, you likely won’t have the desire. You won’t be sleeping well, you’ll constantly feel like you have to pee, and standing on your feet for hours on end at a wedding reception won’t be something you’ll want to do. You also might have a strong desire to nest and spend time getting the house ready for its newest addition. Plus, your little one could decide to arrive early and thwart all your last-minute plans. All of my friends who have been pregnant say the last few weeks of pregnancy are physically draining, and I believe them. Then, your child will arrive and life will be hectic for two months. You may go out a couple times with local friends, just to prove to yourself you can do it, but mostly people will come to you during this time. If friends and family members offer to make you dinner or do your laundry or wash your dishes during this time, take them up on their offers. (You can return the favor at some point.) Your dogs will probably be very jealous that there is a baby getting all your attention, so be prepared to spend daily time with them to help keep their behavior under control. If you and your child are healthy, things become easier during the three to nine month range in comparison to those first two months. Your social life will perk back up and traveling will be relatively simple. The Holidays might be a perfect time for you to travel to see family — but if you plan to go by airplane, be sure to check with your child’s doctor first. A long car ride might be better suited for your specific little one’s ears (and easier to transport all the baby gear). The big hit to your social life will most likely happen when your child becomes mobile. Even though your child-less friends will say they love your baby, the novelty starts to wear off when your kid can break their stuff. Family members and friends with children seem to be less annoyed by toddlers, so your social life will probably veer toward these relationships. As a result of this period, I’ve certainly become closer to my parents, which is a wonderful benefit. Also, this time is so much fun with a little one because they start to be less like a blob and more interactive with vibrant personalities and crazy preferences. There are babysitters you can pay to watch your child in the evenings and on weekends while you socialize with friends (ranging between $15 to $20 an hour where I live) — and I recommend having a date night with your husband at least two to four times each month and some alone time for yourself, too — but you probably won’t use a babysitter as much as you think you will. It’s not just a money issue, but a priority issue, especially if you both work outside the home and your child is in daycare for eight to 10 hours a day. Time with your child will be rare (maybe only two hours when he/she is awake each weekday), and passing up those awake moments can be difficult. You’ll notice another shift in your social life around age two and three, when your child starts demanding play dates with specific friends from preschool and getting invited to birthday parties. You’ll befriend your child’s friends’ parents, and you’ll start to hang out all together. Your social life will be active again, but in a different way. Your family will also demand that all major holidays and vacations are spent with them (because they want to hang out with your cool kid), and they will be hurt if you don’t come to visit or have them to your place. (This is often less of an issue if your parents already have a slew of grandkids.) This also might be when you decide to have another child and start the cycle all over again. Children are amazing, and you and your husband will love being parents, but your social life will change to reflect your new priorities. My advice is to jam pack your social schedule this May and June, ask friends and family to come to you July through October, make plans to see family at the Holidays in November and December, and then expect to see more of your local friends in January through May of next year. After May 2012, you’ll just have to follow your little one’s lead. Schedule daily time with your pets to keep their jealousy under control. And, most of all, enjoy the blessing of your larger family as much as possible. Thank you, Nichole, for submitting your question for our Ask Unclutterer column. Check back in with me in a couple years and let me know how things worked out for you. Also, check the comments to see what other readers have to say and if their experiences are like what I described. What do you do when you come from a culture where gifting is part of etiquette? For example, when my daughter turned one recently, my mother who happened to be visiting from our home country brought back TONS of clothing (whether the right size or not) and toys for my daughter. It was overwhelming. Most of the items are either not usable in the near future, or my daughter has no interest. I don’t have a problem going through and donating or re-gifting, but it takes so much of my time! Should I just talk to my mother although she may get upset? Thanks! I know it can be frustrating to be bombarded with stuff you don’t need. And, the smaller your space, the larger that frustration can feel. As frustrated as you’re feeling, though, the last thing you should do is tell your mother that she can’t give your daughter gifts. Showering grandchildren with gifts is one of the joys of being a grandparent. It is clear that your mother is thrilled to have your daughter in her life, and one of the ways she is expressing that is by giving her as many wonderful things as she can. As much as it feels to you like a burden, her generosity is a blessing. Not all kids have grandparents who show interest in them or give gifts or are alive. Remember that it’s the act of gift giving that is important, not the gift itself. Tell your mother thank you for being so generous with your daughter. Accept the gifts, write her a note of appreciation (have your daughter do this when she learns to write), and then decide what you want to do with the items after your mom has returned home. Keep the things your daughter wants or that you think she can use in the near future. Donate to charity clothing that won’t ever work for your daughter. Re-gift toys that weren’t a hit with her. If your mother purchased items in the states, see if you can return the unwanted items for ones your daughter can use. It does take time, but not more than a few hours, and it won’t damage your relationship with your mother. Don’t pressure your mom into buying things your daughter needs or wants. Don’t give her a guilt trip or hint in any way that you have been disappointed with gifts she has given in the past. Just let her know what your daughter could use, and then let it go. Whatever your mother decides to give is up to her, and her act of gift giving should be sincerely appreciated — irrespective of if you keep the gift or not. As a final note, I want to point out that some of my son’s favorite things are gifts generous friends and family members gave to him that I never would have purchased or thought my son would have loved. Conversely, some things we put on his wishlist that we thought he would love, turned out to be total duds. Thank you, Wendy, for submitting your question for our Ask Unclutterer column. When you leave your home, you may have a babysitter, pet-sitter, or house-sitter watch over your children, pets, or things. Completing an information sheet with important contact and vital data can keep you and the sitter organized and ready for anything. You can print and fill out these forms exactly as they are, or use them as inspiration for creating your own. 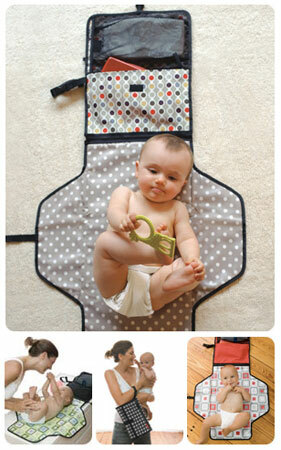 Diaper bags — like purses and wallets — can be magnets for clutter. I speak from personal experience when I say that things go into them and rarely, if ever, come out. The smaller the bag, usually the easier it is to keep it clutter free and stuffed only with essentials. Small bags like this also can be slid into a larger bag, if you need food or blankets for a longer trip. 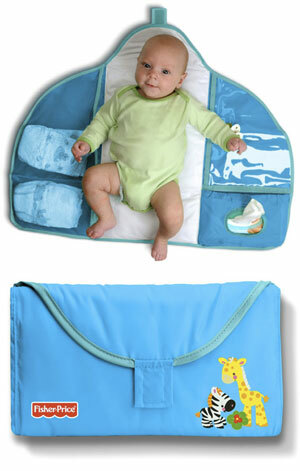 Both options are great for reducing the bulk and the clutter that plagues so many traditional diaper bags on the market. Now that my son has outgrown his Jumperoo, my husband and I have been on the lookout for a child-size chair. Like most toddlers, my 15-month-old son is insistent upon asserting his independence, and so he wants his own chair. If you try to sit on the same chair or couch he’s on, he’ll go to great lengths to get you to sit somewhere other than his piece of furniture. We considered getting the Kapsule Chair because it is cute, inexpensive ($49), and doubles as toy storage. Ultimately, we didn’t buy it because when our son outgrows it in a couple years, the chair becomes another thing cluttering up the house. It’s 21″ x 18″ x 18″ and weighs 16 lbs. It’s certainly more expensive than the Kapsule — the Candu Chair is $125 on Amazon — but it’s a piece that should have utility for at least the next 17 years. For families like ours that live in small spaces, the more multi-functional the furniture, the better. It’s actually a repurposed computer desk. 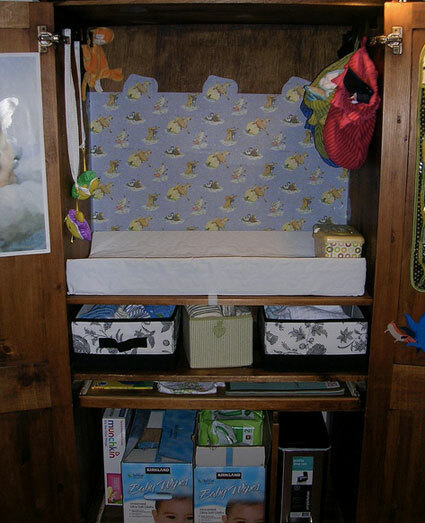 I’m a working, first-time parent (as is my spouse), and I wanted to have everything organized and accessible for those bleary-eyed baby changings. The trash can (the step function is essential) sits where the computer once did. 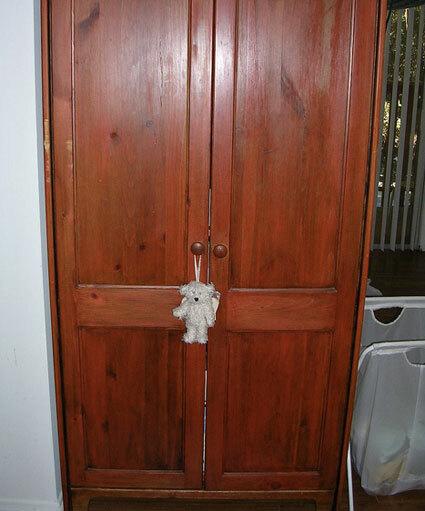 When closed, the baby station just looks like an armoire. The baby’s laundry basket is just to the right (soiled items can be tossed in even when the station is open). Check the Flickr pool for more photos and even the cutie baby boy who “works” here. Thanks to Apostrophe Lover for this great office transformation.